Is your lawn troubled with these common problems? We’ve identified the most common problems and how we can help tackle them. Homeowners complain more about moss on their lawn than any other lawn problem. Moss thrives in damp and shady areas. Lawns usually affected are those with heavy surface thatch or compacted soils. Apart from thatch and soil compaction the most common cause of moss on lawns is mowing too short. It is important never to cut your lawn less than 25mm (1”) unless, of course, you like moss on your lawn. This is because lawn grasses struggle to survive when cut very short. Will raking get rid the lawn of moss? Lawn raking, will remove the moss in a lawn. In short, lawn raking reduces the effect – moss. 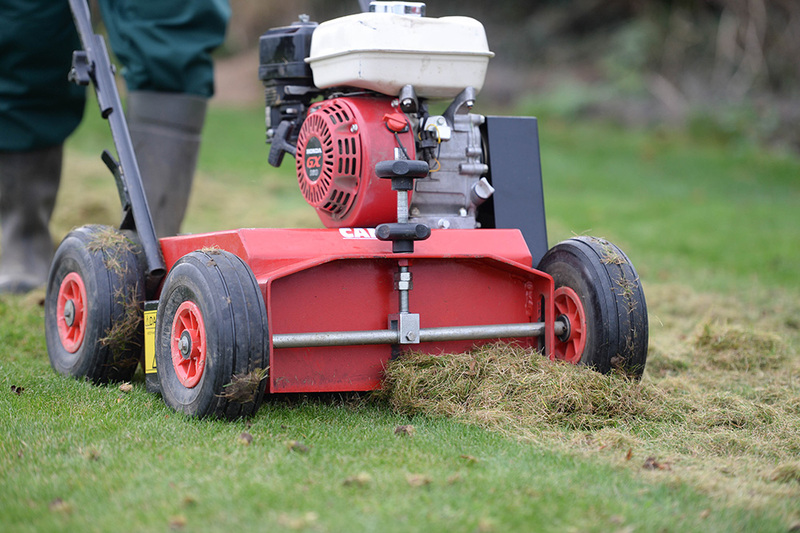 Scarification and Aeration reduces the cause –thatch. Thatch is a layer of living and dead organic matter, found between the grass leaf and the root zone. There are two types of Thatch: surface and sub-surface. In severe situations the grass root zone can be found in the thatch layer. Scarification addresses surface thatch, Aeration sub-surface thatch. Moss control is included in the Nutragreen autumn/winter seasonal treatment. It works by dehydrating the moss, turning it black and bringing it under control. Nothing treats moss better than Scarification and Aeration and of course don't cut your lawn too short. Daises, dandelions, clover, buttercups. All very nice in a meadow, but not in the middle of your lawn. These wild flowers growing in the wrong place are usually the main reason why someone chooses lawn treatments. Do GreenThumbs treatments deal with my weeds? Of course and generally, you can expect over half of your weeds to die-off in any one treatment. So after three or four treatments, most of your weeds will have disappeared. However, it is a never-ending battle to keep your lawn weed-free as seeds lie dormant and others are blown in from neighbouring locations, on going treatments are necessary. Below is a selection of the most common lawn weeds, although your local operative will be able to advise you when he carries out a lawn analysis if you have anything more 'exotic'! Flowers fairly early on in the year, around April time and has vigorous rooting runners; common in damp lawns and clay soils. A low growing perennial with heart shaped leaves. Flowers between February and May with a single yellow flower which only opens in bright sunshine. This is a prostrate annual with weak stems, which can grow up to 40cm long. It has white flowers, which flower from February to November. The bane of many gardeners' lawns, this weed has rooting stems which creep along the soil surface. Flowers are white and appear between May and October. One of the most common, and popular, lawn weeds, the daisy is a tufted perennial with tightly packed flowers. The flowers appear all through the year, peaking towards the late spring, and have a yellow central disk with white petals. Easily recognised lawn weed with a single, solitary yellow flower, which sits on a fairly weak hollow stalk, and flowers from March to October. There are various species of plantain, which are common on bare ground but equally happy on grassland. This broad leaf weed grows close to the ground and is tolerant to trampling and mowing. Very common in amenity grassland and turf, with creeping stems and small lilac flowers, with a white centre; flowers from April to June. Low growing but can reach lengths of up to 50cm. With 3 small, oval leaves and a tiny yellow flower, which appears between May and August. Lawn disease comes in many forms; it is generally caused by fungus which attacks the grass and deprives it of vital nutrients. Red Thread is the most common disease, as well as Fusarium, Leaf Spot, Snow Mould and Rust. They can all affect the lawn, causing discolouration, weakening of the plant and ultimately killing it altogether. Disease is caused by the grass plant becoming stressed and therefore more vulnerable. Stress can be caused by many reasons such as: drought, moss, compaction or even incorrect mowing. Maintaining a healthy lawn is the best way to prevent lawn disease. However, if a lawn disease is affecting your lawn, we can treat it. Of course prevention is always better than cure, so it is important to look at reducing the conditions which favour lawn disease. It is recognised by a pink/reddish tint on the grass blade. Upon closer inspection, very fine needles can be identified protruding from the grass blades. In very severe cases you will see pink mycelium, almost like small flocks of cotton wool. Although high humidity is the main cause of Red Thread. It can also be seen in lawns affected by: poor cutting regime, drought, thatch, compaction, or lack of feeding. Regular lawn treatments, correct mowing and programmes which reduce thatch will help to keep it in check. Microdochium Patch (Fusarium) is another very common lawn disease, seen mainly, but not exclusively, during the autumn and winter months. This is a cool weather disease and enjoys persistent drizzle and foggy/misty conditions with low air movement. Symptoms appear as small, circular, yellow patches which can spread up to about 30cm in diameter. Once established, the patches turn a yellow/brown colour and in severe cases can kill the grass. After the disease becomes inactive, the area appears pale and straw-like. Lawns that have a high thatch layer and poor drainage, as well as enclosed lawns with little air movement, are the most susceptible to this disease. Leaf Spot is a very common lawn disease that affects lawns across the UK. It can also be known as leaf blight or net blotch. The disease can be caused by numerous different fungi and spreads rapidly. Warm and humid weather conditions are favoured by this disease and spores of the fungi are disseminated by water splash. A stressed plant is more likely to be affected than a healthy one, so ensuring the grass is well fed and watered will help. Also ensure the mower blades are sharp and do not cut the grass too short. If the lawn suffers from thatch, consider having machine work - Aeration and Scarification will help to keep the sward healthy, thus reducing the likelihood of disease. There are other pests that you may come across, and your local operator will be able to advise you accordingly. It was always thought that this disease was not found extensively in the UK, however reports are indicating that it is more prevalent than first thought. The fungus that causes this disease is known as Sclerotinia homoeocarpa. Patches are usually very distinctive and often circular, and can coalesce to form large affected areas. Within the patches, dead grass is bleached white or straw coloured and they may also be sunken. Conditions which favour this disease are warm and humid, plus heavy dews and low nitrogen nutritional levels. The disease also favours certain grass species such as slender or creeping red fescues. It has also been identified on many other species but these seem to be the most susceptible. 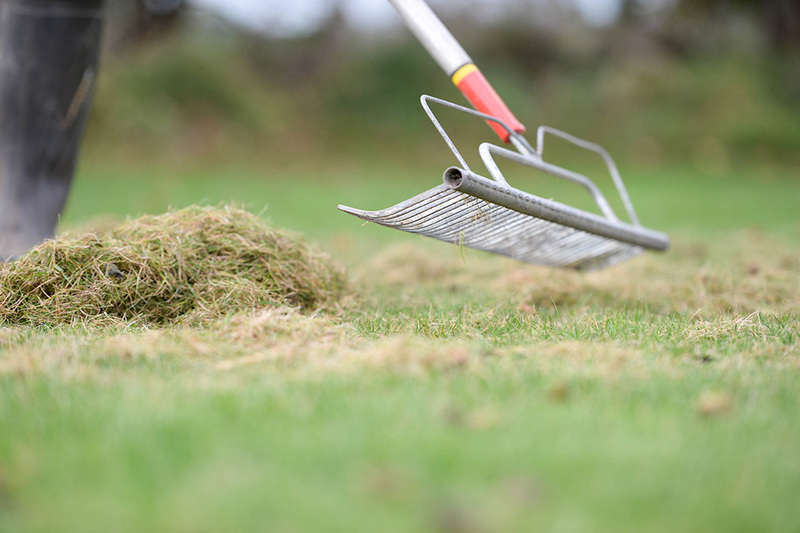 Culturally, the best advice is to cut the grass regularly at a high setting with a sharp blade, ensuring that there is not a lot of thatch present in the turf surface. The best results are always achieved when the turf surface is kept dry so aeration may also play an important role. Due to the fact that it is also encouraged when Nitrogen levels are low, then fertilising is important, particularly on light sandy soils, due to the potential for leaching. The other approach to control is the use of an approved fungicide; the key to this working correctly is application and timing. The product that we use is an azoxystrobin, which works by systemically moving through the plant not only as a cure, but works to keep the plant healthier for longer. In cooler weather, the suggested fungicide is Fludioxonil. As a contact this will work better during the dormant part of the season. This is possibly one of the oldest known turf diseases. It attacks the leaf plant and causes extensive damage. It rarely attacks the whole plant, so recovery is usually good. This disease thrives on plants suffering from stress, and is most prevalent in autumn or early spring, when the weather is warm and wet. If your lawn is looking under the weather, tired and not the right colour, speak to your local GreenThumb expert who will be able to offer great advice and solutions. Very closely related to Microdochium Patch (Fusarium) is Snow Mould, another cool weather disease that thrives in lawns with poor air circulation. This fungal disease spreads rapidly during cool weather, especially under a blanket of snow, where there is no air circulation. When snow settles on a lawn for any length of time, it incubates the disease which can only be seen once the snow has melted. The fungus produces white, dish-like patches which, in severe cases, can turn pink. It is not possible to keep snow from the lawn so be prepared to deal with this once the snow has melted. 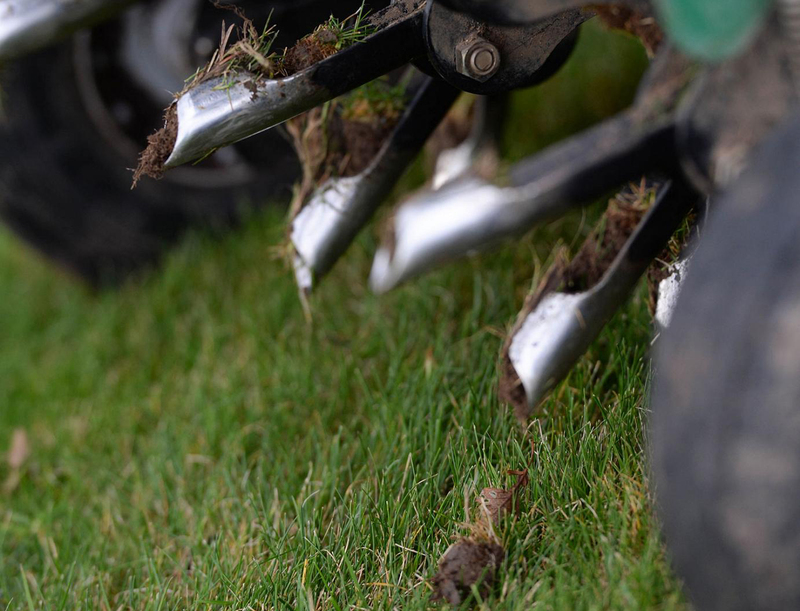 What will help is to get the air moving in the lawn as quickly as possible so a hollow-tine aeration can help, along with an application of a micronutrient to help the grass. The other option is an application of a fungicide which will stop its activity and, as the weather improves then, if necessary, action can be taken to help with the recovery of the lawn. There are two pests which cause major changes to lawns in the UK. Leatherjackets and Chafer Grubs. We control these pests using a biological method using Nemotodes. Leatherjackets are the larval stage of what is commonly known as Daddy Longlegs (Crane fly). Their one-year life cycle begins when the female lays her eggs in the lawn, around September time; they then hatch 2-3 weeks later. Over the winter period, when the weather is still wet and warm enough, the larvae starts to feed on the top part of the grass plant’s root system. At this time, the damage is not normally seen as the Leatherjackets are still quite small. It is important to note that secondary damage to the lawn can also be caused by birds and animals rooting for the grubs. By February and March, the grubs will have grown in size and the damage will be much more extensive. Chafer grubs are the larvae of the Chafer beetle (May bug) and have a life cycle of 1-3 years, dependent on the species. The females lay their eggs in the lawn. When first hatched, the grub is very small and at its most vulnerable. They are curved like the letter C, with white fleshy bodies, light brown heads, 3 pairs of legs and will grow to 10-15mm in size. The grubs feed on the roots of the grass plant resulting in the turf becoming detached from its soil moorings, allowing the lawn to be pulled back, like lifting a carpet. Birds, badgers and a number of other animals enjoy eating these grubs so damage to the lawn can be extensive. Worms are generally good for the lawn; there are 25 species however, there are only 3 that cause casts in the lawn. The process worms have by moving through the soil is good for microbial activity and aeration. The cast that they return to the surface can look ugly and be a good seed bed for weeds. At the time of writing we have no specific control for worms. At the time of writing we have no specific control for ants however, we would advise using a spade, slicing into the lawn where the activity is and apply ant powder into the nest, pull out the spade and restore the crevice. Dry Patch is best described as a waxy coating found in soils making the area resistant to water: hydrophobic. There is no clear reason why lawns get Dry Patch. It is not a disease. Being hydrophobic, Dry Patch has a massive restriction on the lawns access to water. Its effect is similar to polish on a car. Water just runs off. With water being essential to a lawns health, Dry Patch needs to be addressed. How can I tell if my lawn has Dry Patch? Looking at your lawn from an elevated position you notice areas of the lawn looking a darker colour than other parts of the lawn. This could be an indication of Dry Patch. If you water an area of your lawn and it stays on the surface this is an indication that dry patch may be underlying in the soil. If it does permeate the soil very slowly, it could be a drought issue which if not corrected, could deteriorate into Dry Patch. Examination of the soil- by taking samples- reveals the soil is extremely dry (sometimes almost powder like). Another identifying mark might be the presence of a whitish substance that looks chalky, known as mycelium. This will be related to Dry Patch too. Does GreenThumb have a treatment which is specifically tailored to treat Dry Patch? How can I prevent Dry Patch from happening in the future? Our regular treatments Aeration, Scarification and our Oasis treatment is a great way to help prevent dry patch. Both our Enhanced and Complete programmes include all of these treatments. Toadstools/Mushrooms are the fruiting bodies produced by fungi that can be found in the lawn. Most are generally harmless and occasionally can be beneficial to the eco system. Although the fruiting bodies are clearly visible it will take an expert to distinguish whether they are edible, so we don't recommend you eat them. Toadstools in the lawn are not always a cause for concern, however when you get mushrooms in a circle then this could be evidence of a fairy ring, this is discussed on a separate page. What to do with the odd toadstool or mushrooms in your lawn? Before cutting the lawn try and remove these from the lawn using either a rake or if the lawn is short enough a stiff brush will help, if you cut the lawn with them on you increase the risk of spreading the spores and increasing the numbers that may already be there. We generally find good maintenance of the lawn with aeration and scarification reduces the numbers the following year, we also see high incidence of these when we are seeing extremes of weather, for example when it goes from dry and cold to warm and wet, the humidity will stimulate their activity. It is also a sign that the microbial activity within the soil is high, this is good as it helps to ensure that when we are feeding the lawns the microbes are helping to share the food around the grass plant. If you have heard that it is wise to apply a fungicide please ignore this practice, fungicides will have an impact on the fruiting bodies that are there for a short time; they will have no impact on the ones beneath the soil which can pop up over night. There was a popular belief that when you see a darkening ring in your lawn this had been caused by fairies dancing on the lawn. We now know this is not a fact! There are typically three types of Fairy Rings on a lawn. dead grass, with mushrooms at the edge. This is the worst type. How do I know if my lawn has a Fairy Ring? Look for the signs outlined above. Trying to water the area would probably show that it is not allowing water to penetrate the surface due to the soil becoming hydrophobic. Taking a soil sample from the area will show white fungus in the soil and no moisture in the area at all. It will also smell musty or mouldy. What can be done if my lawn has a Fairy Ring? Fairy Ring are not easily controlled due to challenges caused by their source, a measure of control can be gained by treating the areas with a soil fungicide and a good water conserver. GreenThumb will recommend the best approach as the treatment will be commensurate with the severity of the condition. There isn’t a one size fits all solution and we would like to give you the best advice for your Fairy Ring. Mowing is the most important practise in maintaining your lawn. Correct mowing can make a huge difference to its health and how good it looks, even with lawn treatments. In a warm winter. Perhaps on a windy day mowing the lawn will reap benefits in the spring, preventing the grass being too long for the first cut of the year. Does GreenThumb have a treatment which improves the lawn and recudes mowing? - Yes it's called SlowMow. Plants love water. Lawns are plants too. Lawns love water. Thankfully our climate means that occasions we actually have to get the hosepipe out are not more than a few times in a year. Today there are inexpensive and clever little timers you can attach to a hosepipe which time and regulate the amount of watering without you having to stand on your lawn waving our arms from side to side. Your local garden centre and even Amazon sell them. In periods of dry weather, the lawn will thank you for a drink. Earlier in the morning or evening is probably the best time to set the timer for the sprinkler to come on. Water the lawn long enough for the lawn to have had a good soaking. Its difficult to say how long this is as lawns differ in their exposure and makeup. But if you pushed us to make a recommendation it would probably be between 20-30 minutes. Even if you are on a meter. The small cost of weekly watering during a hot spell will prevent your finer grasses or lawn edges dying off. Its cheaper than returfing or reseeding. The most common mistake we come across in periods of dry weather is homeowners cutting the lawn too short. In periods of dry weather our advice would be please, please don’t cut your lawn. If you have to… set the mower height to at least two inches. The lawn will thank you. It will stay greener much longer, make more efficient use of the watering and recover quicker. Does GreenThumb have a special treatment to help with dry weather and make the best use of lawn irrigation? Funny you should ask… Yes we have. It’s called Oasis. 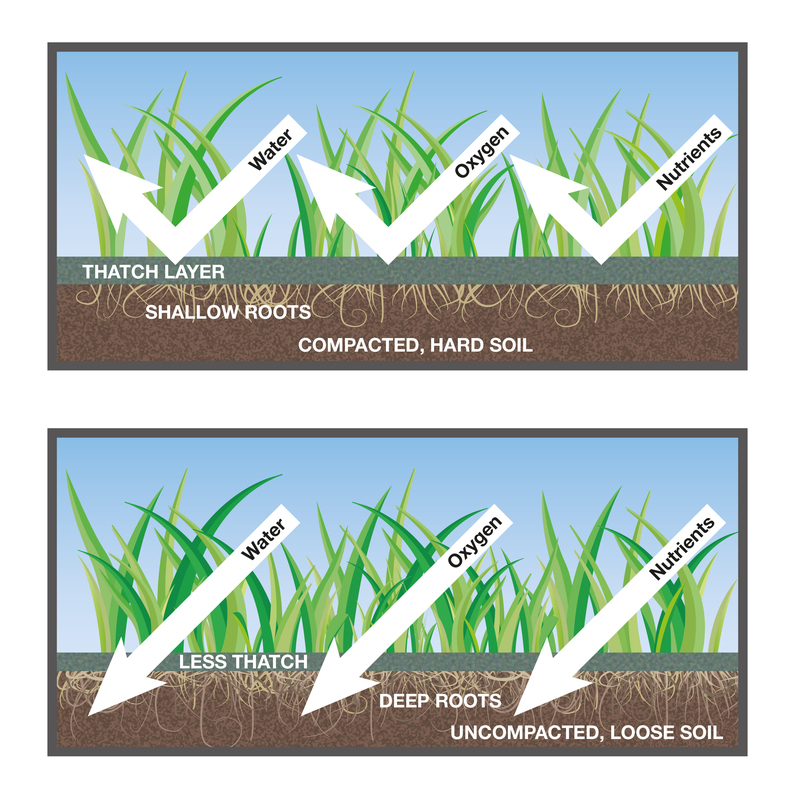 Lawn compaction is the condition beneath a lawn’s surface where the soil particles are compressed. Compaction is a very common lawn problem and a challenging condition for a lawn’s health. 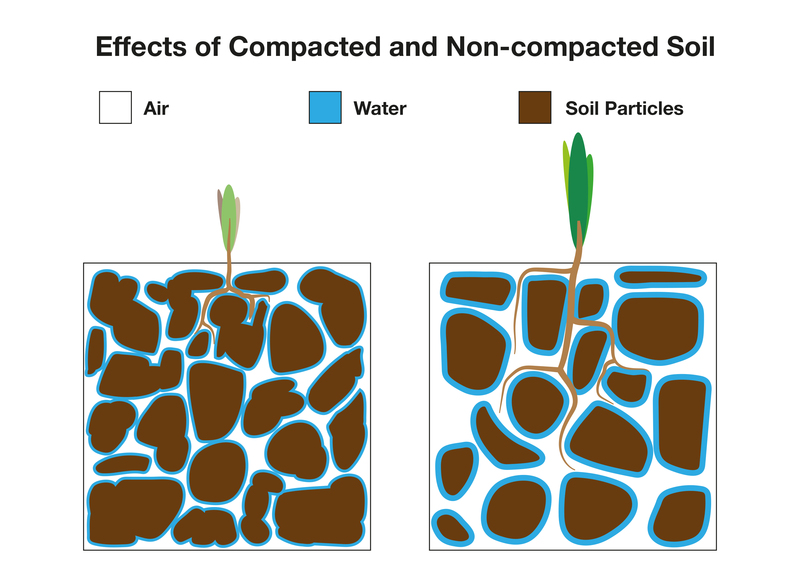 Clay soils are especially susceptible to compaction, but other soil types can suffer with it too. What is the best treatment for lawn compaction? Aeration and in most cases Fracture Tine Aeration. 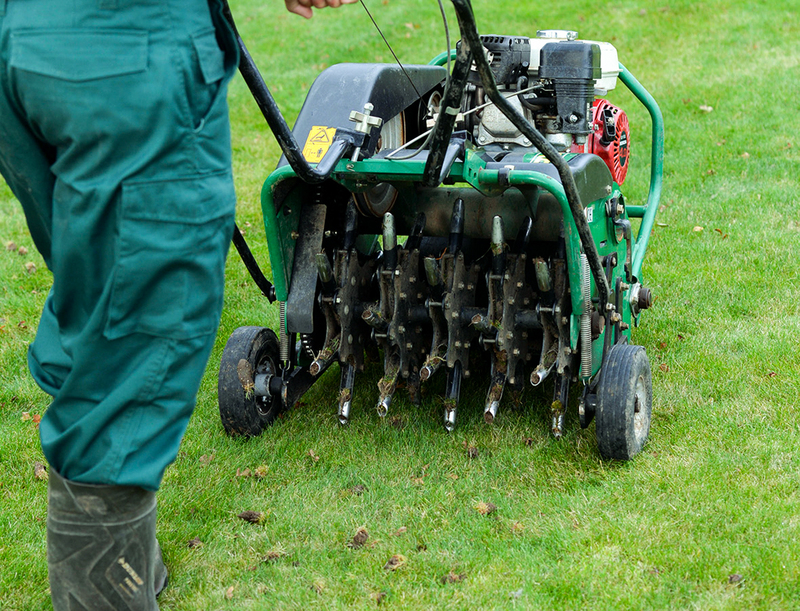 For more information about what Aeration can do for your lawn, read more here. Thatch is the name given to an accumulation of dead grass, decomposed grass roots, leaves mixed with some living stems and in extreme cases, living grass roots. Thatch naturally forms in a lawn. It becomes a problem when it grows thicker, then it decays. Thatch is a main cause of moss on lawns. There are two types of lawn thatch; surface and sub-surface thatch. With mowing, grass growth and seasonal changes in temperature; lawns quickly develop a layer of thatch above the soil line, which encourage moisture to sit in the thatch layer. A little surface thatch on a lawn is a good thing; it helps to hold moisture, keep the soil cool and protect the grass from drying out too quickly. Too much surface thatch prevents the grass roots from sending roots into the soil and also creates the perfect conditions for moss. The result of excessive surface thatch is a spongy, mossy lawn. How do you keep on top of Surface Thatch in a lawn? Annual Scarification helps to keep thatch down to acceptable levels. Sub-surface thatch is a layer of dead organic matter which forms a mat between where the soil line should be and the soil. Often the soil line becomes the top of the sub-surface thatch layer. This barrier makes for a very weak, prone to moss and disease lawn. Lawns often have surface and sub-surface thatch at the same time. If a lawn has sub-surface thatch it will usually have surface thatch too. You cannot just slice the thatch layer off the lawn, it has to be thinned out by removing vertical cores. How can GreenThumb tell if my lawn has Sub-Surface Thatch? We do this by removing cores from the lawn and looking at the thatch layer. How do you thin out Sub-Surface Thatch? Hollow-Tine Aeration, which removes thousands of plugs or cores from the lawn is the most effective form of thinning-out sub-surface thatch. 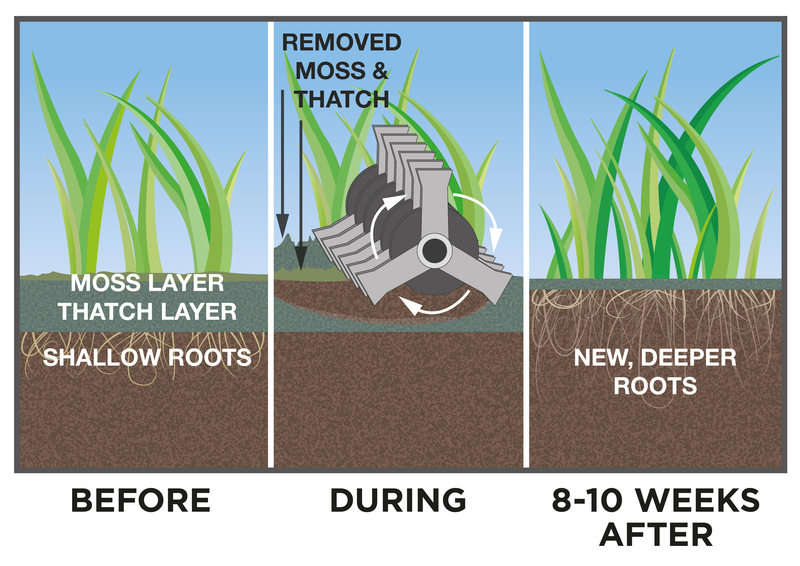 For more information about Aeration, click here. The image below shows the effect on a lawn with sub-surface thatch before and after Aeration.